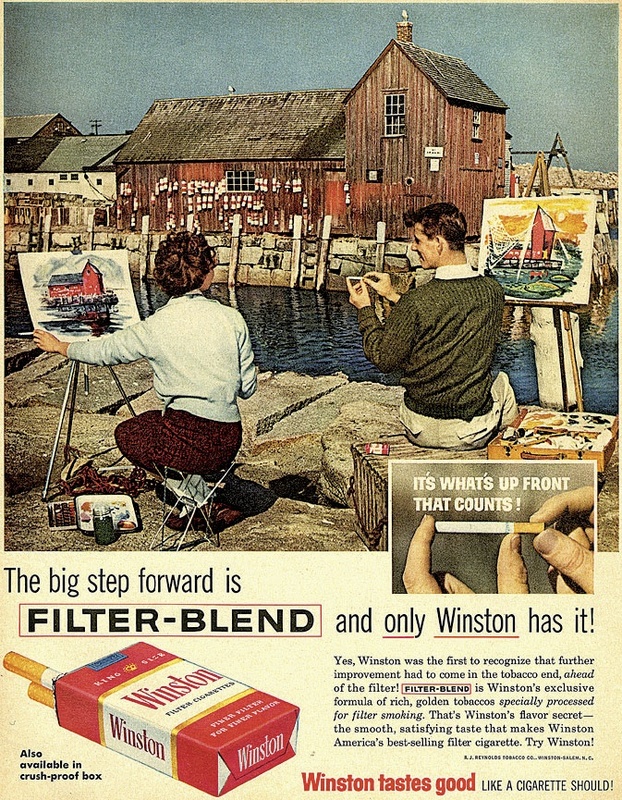 This 1960 cigarette ad highlights Motif No. 1, a favorite artists’ subject in Rockport, Massachusetts. Primus waves stars and stripes to celebrate Flag Day, June 14. Millar is an independent scholar interested in both architecture and ships; when studying the harbor scene engraved on the horn, he saw a flag of this design flying atop a fort and notified the Flag Research Center in Winchester, Massachusetts, of his discovery. 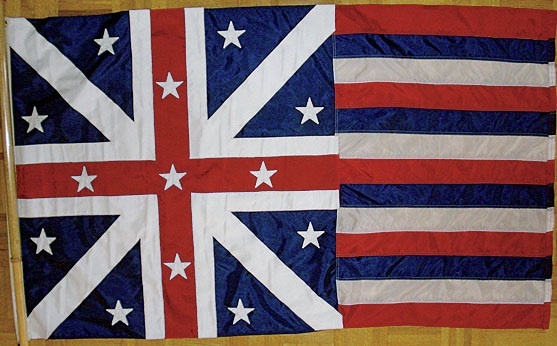 The engraving was not large enough to let him discern whether the 13 stars on the flag had five points or six; he chose five for this recreation, which he now displays at Newport House Bed & Breakfast, an elegant establishment that he and his wife, Cathy, run in Williamsburg, Virginia. The official American flag in 1776 was the Grand Union, Millar reminds us. It had the British union in the upper left canton and 13 stripes in the fly—no stars. Congress authorized a new flag on June 14, 1777, with 13 stars arranged in a circle. Millar is amazed that the existence of the flag he found depicted some 15 months earlier should have gone unnoticed for so long in a country so interested in its flags. Should your summer travels take you to historic Williamsburg, stop by the B&B to look at the flag and say hello to the Millars’ pet rabbit, Josephine Bunnyparts. Napoleon Bunnyparts, her predecessor, has gone to his reward. Hot motif. L.M. Vincent ’73, M.D., calls himself “an outsider to all things maritime.” He grew up in Kansas. He saw his first live lobster in a tank at a steak house when he was 12 and was suspicious of it because it wasn’t red. He has never caught a fish. He has been on sailboats but with trepidation, not from fear of drowning but rather “the anxiety that I will be assigned tasks that involve ropes.” How, then, did he come to write an entire book about a fish shack in Rockport, Massachusetts? Vincent’s day job is instructor in radiology at Harvard Medical School and attending physician at Brigham and Women’s Hospital. He lives north of Boston near the coast. A cousin recommended that he visit Rockport to see Motif No. 1. “What is Motif No. 1?” asked Vincent. “You’ll see,” said the cousin. The heavily illustrated In Search of Motif No. 1: The History of a Fish Shack proves he did. Who would argue with a coffee cup? The ubiquity of Motif No. 1 is such that it appeared in this cigarette ad from 1960. Should summer travels take you to Rockport, tip your hat to Motif No. 1.